Retrospective reviews are normally the preserve of cult cars or automotive legends, so you’re probably wondering what makes this French shopping cart worthy of such a feature. Well, it’s because this pugnacious little beast is probably one of the most entertaining hatches that you’ve never heard of. Launched at the Geneva Motor Show in 2010 the Citroen DS3 Racing was the first road car to be developed by Citroen Racing. Yes, the brains that produced the extremely successful DS3 World Rally Car for multiple champion Sebastien Loeb. There’s no mistaking a DS3 Racing for another model, despite the fact that only 200 of these cars made their way into the UK. It came in just two colours: Polar White and Obsidian Black shown in the car featured here. The Sport Orange stickers were an optional extra which catch the eye, but divide opinion. They could easily be dismissed as an over the top, especially the “caution * attention” warning that adorns the petrol flap. But somehow, though, the decals define the car’s personality. They show that the DS3 Racing was designed for one purpose – fun. The wheel arch extensions are made from real carbonfibre as is the motorsport inspired front splitter and rear diffuser. It’s a neat touch which is continued into the cabin. The centre console, door trims and even the steering wheel are swathed in carbon. The Citroen Racing bucket seats are incredibly comfortable and supportive. So supportive, former Top Gear leader Jeremy Clarkson referred to them as “epic” and “would be more at home, in an F-22 Raptor”. Under the bonnet, the DS3 Racing uses the same 1.6 litre turbocharged unit found in the Mini Cooper S, but with Cirtoen’s own unique tune. The engine delivers 207bhp & 203lb ft, which will see it sprint from 0-62 mph in 6.5 seconds, two tenths quicker than a Renaultsport’s Clio 200. The designers found also continued with their carbon fetish here too. The rocker cover is embellished with more high quality weave. The Citroen Racing logo and the world rally champion logos remind you of the car’s competition DNA. 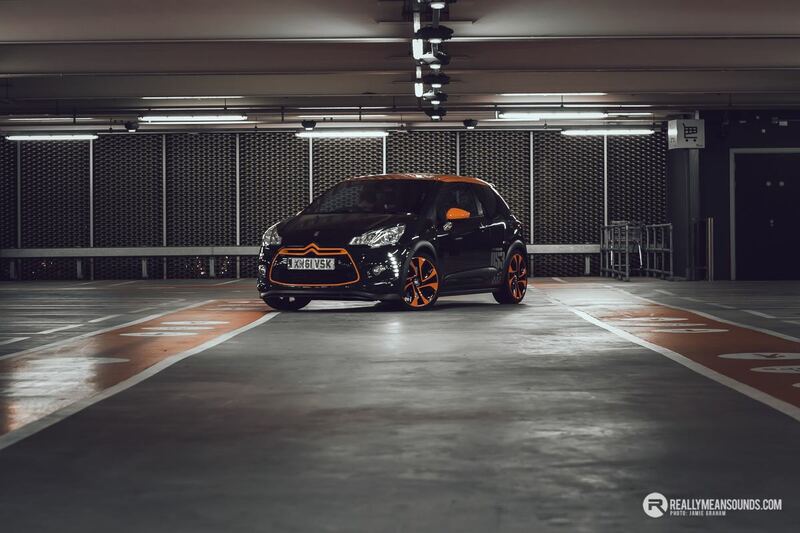 The pièce de résistance of the Ds3 R is the pin sharp handling and responsive chassis dynamics. The Racing sits 15mm lower than the standard DS3 and has a 30mm wider track. The 18 inch wheels have vibrant orange accents to match the car and hide a set of massive 323mm discs which are hugged by a set of Brembo developed four-piston calipers. On such a small car, the braking power is incredible and really builds confidence when attacking corners. Unlike it’s rivals, the DS3 Racing has one potential Achilles heel – the lack of a limited slip differential. Whilst the car has traction control, it doesn’t allow much in the way of slip. With the driver aids disabled, it will break traction. But it’s worth pointing out, despite the Racing nomenclature, the DS3 was never meant to be a ‘ring lapping track monster. When it was released, Car Magazine bestowed it with a 5-star review and the car promptly sold out in super quick time. The mixture of practicality, zest and performance, as well as its ability to return surprisingly sensible fuel economy make it a perfect choice for commuting in and around London, as well as those B-road blasts. Regardless of the critical acclaim and obvious demand, Citroen chose not to release any further versions. As a result, the DS3 Racing disappeared under the radar. Until now. Great car, I always liked the DS3s, nice write up Jayme!